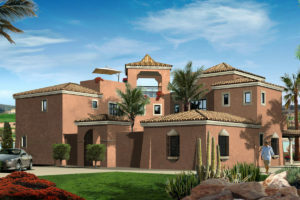 The 'Country House' range includes The Herencia, The Residencia and The Caprichosa; their position at the top of the hierarchy of homes at Desert Springs is clear from the moment that they are first seen. 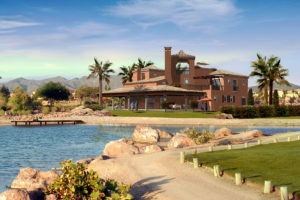 They have an appearance of age, permanence, solidity, strength and tradition that stems from their fairly massive but simple form and lack of fussy detail, as typified by the largest of the old cortijos of the Almanzora valley, such as the Governor’s House at the entrance to Desert Springs itself. They appear simpler and stronger than cortijos in more verdant, less arid, areas of southern Spain, with thicker walls and smaller windows. Buttressed corners, heavy, rough even coarse, render combine to give the impression of thick massive walls. 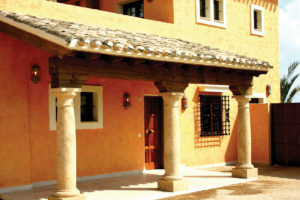 The effect has been enhanced, by using heavy marble columns and timbers, small windows and deep verandas. A range of traditional mouldings has been used around doors and windows. 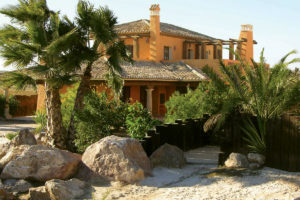 At Desert Springs, the external render used on the walls has different levels of roughness according to the type of building. These Country Houses have the roughest finished render of all the four different classes specified for the housing, despite their being the more expensive properties, the apartments have the smoothest, with the roughest of all being reserved for external boundary walls. The colours of all the buildings have been selected to match and/or accentuate the existing colours of the local soils, rocks and landscape, giving a rich mix of red, pink, blush, beige, adobe, cream, ochre, apricot and orange. The strengths or tones of these colours have been grouped and matched to different home ranges and buildings. The Country Houses have the strongest of these, burgundy red and burnt orange, as befits their size. The windows consist of a mix of ovals and squares with a variety of traditional moulded surrounds. Special care has been taken to achieve as convincing impression of traditional wooden framed, small paned windows as possible, notwithstanding that they are actually high performance double glazed, low maintenance vinyl coated, aluminium, with security bolts and toughened security glass. This has involved specifying traditional profiles of the type used for wood framed glazing, rather than those normally used in aluminium. It was a feature of old Spanish architecture that the Master Builder would sign off his craftsmanship by using, as his signature, a particular moulding around eaves and windows. We have incorporated many different types of these mouldings in recognition of that tradition, some of them on the Residencia and Herencia. The interiors of the Herencia and Residencia have been designed to achieve a sensation of both space and light, despite their external appearance being traditional in style, with apparently small windows. Rather than create a series of closed off rooms, the desire to maximise visual space has resulted in the living room being kept half open to the dining room and hall, which nevertheless retain their distinct sense of space and function. The living and dining rooms also lead, without any steps, out onto the veranda, with level through floors intended to blur the visual and physical division between inside and out, in order to make the best of the year round climate, which means that it is possible to dine and sit out, even in the depths of winter. In the kitchen, careful attention has been given to creating an efficient and convenient relationship between the equipment, surfaces and storage, minimising unnecessary trips to and fro. There are a lot of power points, arranged to be close at hand; mostly located in corners, so that equipment cables lead away from the place of work, rather than across it. The large footprint created by the design has created the opportunity to provide a really enormous full size basement, with a wealth of naturally cool space. Optional extras that can be provided here include home cinemas, billiard rooms, bodegas and bars, sauna and Jacuzzi suites; in one home the underground garage has also been fitted out to provide a private work out area. The bedrooms follow a distinct hierarchy, with the master bedroom naturally being the largest, with an elevated private terrace and direct access to the garden and pool for that late night dip. It has separate dressing, bath and lavatory areas for privacy and ease of use. The smallest bedroom, with its own shower is on the same floor as the master bedroom, so that it can serve as a child’s nursery, an extra dressing room or even as a personal carer’s room. The second and third bedrooms, each with its own en-suite bath or shower room, are on the ground floor, located so as to be semi-separate for guest use and to have direct but secure access to the garden and pool. Finally, a study or occasional fifth bedroom is located totally separately from the rest of the house to avoid disturbance. Optional Extras include: Non-structural alterations, furniture and decoration packages, saunas and Jacuzzis, star beds, aged Italian marble tables, etc. All at various prices according to requirements.